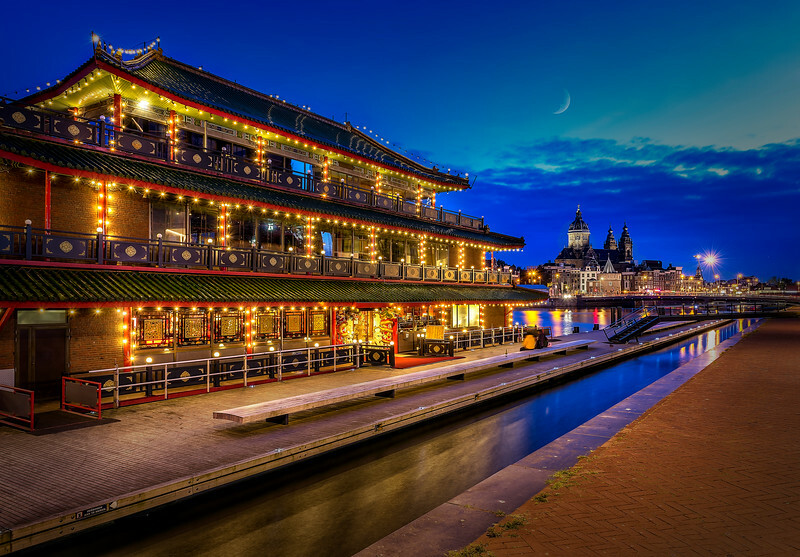 During our stay in Amsterdam, our hotel was very close to this beautiful barge/restaurant. Spending endless hours running around Amsterdam for 4 or 5 days taking photos, we decided to stick close to the hotel. Onto the barge we went for a very "American" Chinese dinner. As we were leaving, I saw this shot and ran up to the hotel room to grab my gear. I quickly set up and as I was about to start shooting, a young couple started having a heated argument right in front of the camera. It didn't seem like an appropriate time to ask them to step out of view, so I waited patiently. Finally, after 10 minutes they walked off and I quickly started shooting away. To my surprise, I was only able to click off 3 or 4 shots before the lights on the restaurant went dark.